It’s a peaceful day in Japan when a strange fountain of water erupts in the bay, causing panic to spread among government officials. At first, they suspect only volcanic activity, but one young executive dares to wonder if it may be something different… something alive. His worst nightmare comes to life when a massive, gilled monster emerges from the deep and begins tearing through the city, leaving nothing but destruction in its wake. As the government scrambles to save the citizens, a rag-tag team of volunteers cuts through a web of red tape to uncover the monster’s weakness and its mysterious ties to a foreign superpower. But time is not on their side—the greatest catastrophe to ever befall the world is about to evolve right before their very eyes. 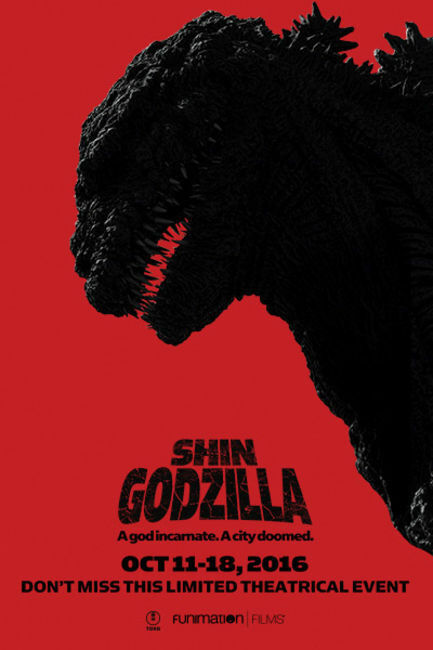 Shin Godzilla represents the latest in TOHO ‘s film series after a 12-year absence since 2004’sGodzilla: Final Wars. The film has earned 5.3 billion yen (about US$51.63 million) and has sold 3.6 million tickets. It has surpassed the earnings of director Hideaki Anno ‘s previous film, Evangelion: 3.0 You Can (Not) Redo . Co-directing with the Evangelion creator was Shinji Higuchi , Anno’s frequent collaborator and the director of the live-action Attack on Titan films. The film opened on 441 screens in its opening weekend on July 29, having sold 412,302 tickets for 624,610,700 yen (about US$6.08 million). The film topped the Japanese box office for two straight weeks, but fell to #2 in its third week, and #3 in its fifth week.